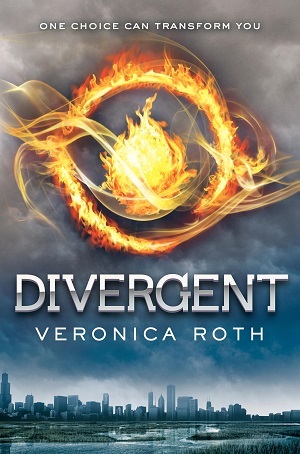 Divergentis a dystopian science fiction novel written for young adults by Veronica Roth. Published in 2011, the story is set in a futuristic Chicago where society is divided into five “Factions,” each dedicated to an all-encompassing virtue that’s guided by what they best believe to combat the evil that grows in society: Abnegation (the selfless), Erudite (the intelligent), Candor (the honest), Amity (the peaceful), and Dauntless (the brave). All must choose which Faction they will devote their lives to upon turning 16, and when the time comes for Beatrice “Tris” Prior, she leaves behind the Abnegation world in which she grew up to move into the realm of the Dauntless – all the while trying to hide what she truly is… Divergent. While the trilogy officially finished with its final installment, Allegiant, which was published to mixed reviews this past October, an adaptation of the first novel debuted on the big screen just last week. While the film itself also earned mixed reviews, fans of the series have still made it a box office hit. They seem to agree that it was more true to the novel than most other YA film adaptations, and praised the talents of its cast, including Golden-Globe winner Shailene Woodley as Tris, and Theo James as Four. Last time, the spotlight was on three of the most important Factions to the plot line of Divergent – Abnegation, Dauntless, and Erudite – but it left plenty of CF readers asking, “what about the other two Factions, Candor and Amity, or even the Factionless?” Well, now we’re here to fill in some of the blanks! Product Information: Blouse – NastyGal, Shoes – Topshop, Cuff – Accessorize, Skirt – Francesca’s, Blazer – H&M, Clutch – Nordstrom. The Candor faction believes that honesty is the best policy… always. Formed by those who believed that the evil in the world was caused by duplicity and dishonesty, members of Candor are known for their radical truth-reliant lifestyle, opting for transparency and openness in every aspect of their lives. 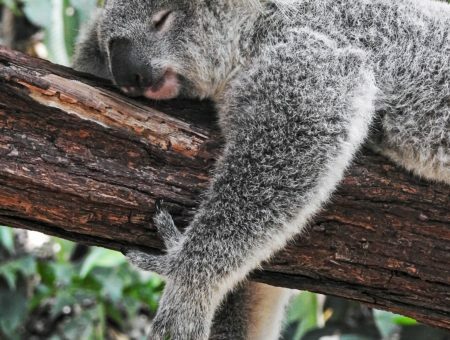 For this reason, there are many members of Candor working in higher-ranking jobs, like law and politics, where such honesty is necessary and trusted. Candor and Dauntless are considered to be rather similar, since honesty and bravery are closely connected. Candor members stick to the colors of black and white, similar to the way they see truth as being either wholly honest or dishonest, and tend to dress more on the formal side. Integrate the Candor perspective into your own outfit by favoring their formality and favorite colors, while also playing with the concept of transparency. A black cropped blazer and white button-down blouse ground the look in black and white, while a black skirt with a mesh cutout makes for an edgy riff on transparency. A clear rhinestone-embellished cuff and a clear plastic clutch utilize the same effect, while intimidating patent black shoes make for a Candor look that is almost as radical as its Dauntless counterparts. Product Information: Cardigan – Ruche, Necklace – Macys, Bracelets – Debenhams, Top – River Island, Boots – Ruche, Maxi – H&M. Whereas Candor relies on honesty for everything, Amity would do anything to preserve peace. An agricultural center, with a pacifistic nature that is quick to move past difficulties and focus on the happiness of the group as a whole (rather than the integrity of the individual), Amity doesn’t factor in to the plot of Divergent so much as its sequels. Still, this Faction is responsible for the food supplied to the entire city, and has a mentality that finds itself at odds with the often-aggressive Dauntless and the recklessly-honest Candor. The Amity Faction wears mostly the bright, pleasant colors of red and yellow, and clothes that are more casual and comfortable than other Factions. Pay homage to the Amity mentality in your own look by working in casual and comfy basics in their favorite colors, as well as ties to their agricultural work. A rust red maxi skirt and yellow crop top bring out the Amity colors, while a shawl cardigan and a pair of brown boots keep it comfortable. A tree pendant necklace references the Amity symbol, while seed bracelets represent the growth of food that Amity controls. 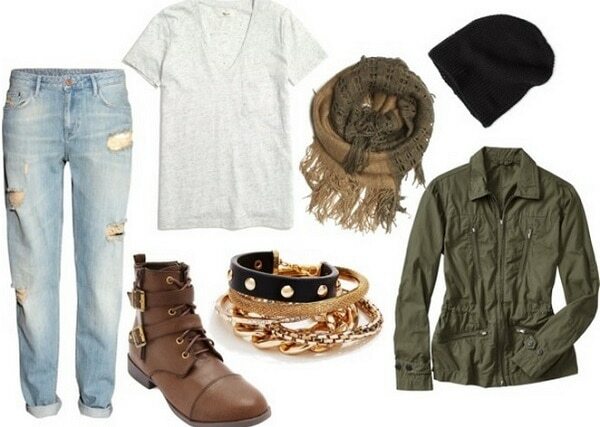 Product Information: Jeans – H&M, Tee – Madewell, Boots – Charlotte Russe, Bangles – Guess, Scarf – Amazon, Hat – American Eagle, Jacket – Gap. Every sixteen-year-old in Divergent is supposed to choose their faction… but it doesn’t mean they’ll stick with them, or even elect to have one in the first place. Those who distrust the Faction system or flunk out of their Initiation become Factionless. Ungrounded in a Faction, dependent on the handouts of Abnegation, as well as the meager jobs given by the other Factions, the Factionless are more numerous than you might think… and they might come to play more of a role in the future of this dystopian city than those in charge might expect. Utilize the Factionless mindset in your own look by adopting aspects of the Factionless wardrobe, as well as referencing their all-inclusive status, as a sort of melting pot for all Factions. A basic black beanie and a speckled tee shirt reference their bleak and minimalist lifestyle, while distressed denim and a ragged scarf reference the Factionless’ status on the fringe of society. A pair of combat boots and a utility jacket work as the kind of gear that they would wear in their menial jobs, while a multi-textured and colored stack of bangles references the fact that all kinds of people – all across the Factions – wind up Factionless. Have you read Divergent, or its sequels, Insurgent or Allegiant? Have you seen the new movie? What did you think of the way the story of the novel was portrayed on film? What did you think of the outfits and styling tips? Let me know, in the comments below!